If there’s one thing that makes the people of Palma (Palmesanos) proud, it’s the exquisite Gothic Quarter: a maze of golden buildings between the cathedral and the river. This spectacular district, and Palma’s Catalan heritage, explain the city’s nickname, ‘little Barcelona’. Loiter by the honey-hued stonework of La Lonja and watch the dulcet Mallorcan dusk transform it into the most beautiful fish market in the world. Soaring above the marinas and boulevards with an aristocratic, seen-it-all indifference is the yellow-sandstone skyscraper of the cathedral, La Seu www.catedraldemallorca.info. It is replete with Catalan art, from Medieval statues to Gaudí’s very 20th-century Crown of Thorns. On sunny days, the sumptuous stained-glass windows fill the sepulchral interior with holy rainbows. 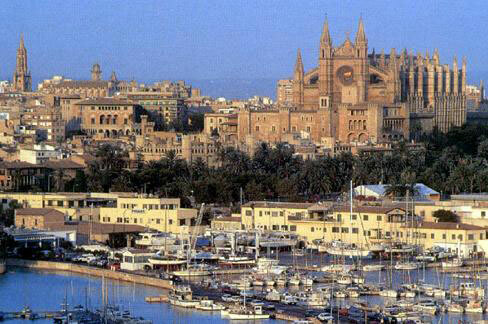 Much of the city may look Medieval, Renaissance or modern, but there’s an even older Palma, too. Mallorca was once Phoenician, then Roman, while the Muslims were only conquered in the 12th century. To get a taste of old ‘Mayurqa’, walk up the secretive Moorish steps to the enchanting Arab Baths (C/Serra 7; £1.35). There are very picnicky gardens, too. A historical must-visit is the imposing Almudaina Palace (www.patrimonionacional.es; £2.90, free on Wednesdays), with its Roman stones in the walls, Moorish loggias and post-Reconquista Gothic battlements. The palace is still the Spanish royals’ official residence when they’re in town (which is often; they adore Mallorca). Don’t miss the shyly exquisite Chapel of Santa Ana. When the sizzling streets get too much, stroll along the coast from the cathedral and you’ll come to the Castell de Bellver (C/Camilo José Cela 17; £2.25). It is the only circular castle on Spanish soil, and within its elegant 14th-century arcades is a museum of Palmesano history. The wooded Mediterranean gardens are the highlight; drink a cold Dos Equis and savour the grandiose views over trendy beaches and the wild, wine-dark sea. Palmesanos may live in a provincial city, but they have a clear sense of themselves as something special, like Parisians with better tans. Good places for people-watching are the 19th-century Plaça Major or the Plaça Weyler , which is full of quaint shops, some with uniquely Mallorcan Modernista facades. The Forn des Teatre bakery, for instance, looks like a puppet-theatre designed by elves. A very recent addition to Palma’s attractions is the suave, burnished Es Baluard – the city’s new museum of contemporary art www.esbaluard.org. The glassy, ziggurat-form architecture alone is worth the euros; then there’s the impressive collection, which ranges from Dalí, via Magritte, to some pungently conceptual 21st-century stuff. Day trips from the city come in all shapes and sizes – a 20-minute bus ride brings you to mega-touristy Magalluf if you want to go. More poignant is the trip to the home of poet Robert Graves (www.lacasaderobertgraves.com; closed Sundays; £4.50; bus 210 from Palma). Find it in arty, bohemian Deià, a super-cute village cradled by herb-scented cliffs on the north coast. Graves himself would often walk the 24km from Deià to Palma in a day.